…but just in case, the STEM (Science, Technology, Engineering and Mathematics) initiative drives me up an absolute wall. It’s not because I don’t think those subjects are critically important, because I do. It’s simply because there’s one little letter that’s missing: an A. Change that to STEAM and we’re all good. Show people that the Arts are just as important as those other subjects and I wouldn’t be blogging about it. What, you may wonder, is the big deal? Well, if you don’t work in the field of Education, I can understand that question, partly because I’ve had discussions about the topic with friends who aren’t involved and have a differing perspective. I get it. It doesn’t seem like a big deal to you – it makes sense to you – but as a teacher, let me tell you why it doesn’t make sense to me. Make no mistake about it, though, we need to make sure our students – both male and female – are exposed to ALL subjects, not just the STEM subjects (and not just the Arts for that matter). First, I have a hard time taking Kutcher seriously – even though he gave a great speech at the 2013 Teen Choice Awards Show. I just don’t see him as a master of coding. Perhaps I’m wrong, perhaps he’s at home in his free time learning how to do it, and if that’s the case, then I apologize. But we see celebrities pitching ideas all the time (I’m supposed to believe that Tiger Woods drives a Buick? ), so that’s not even the biggest thing that bugs me about this. Again, we see the Arts being shrifted – and in this case, by someone who’s made his living as a result of them. “…right next to biology, chemistry, or algebra.” – UGH! How about right next to Drama or English or Pottery or Digital Communications or Choir or Band or Creative Writing thrown in there alongside the others? And again, the last thing I want to do is de-stress the importance of biology, chemistry, or algebra, but c’mon! 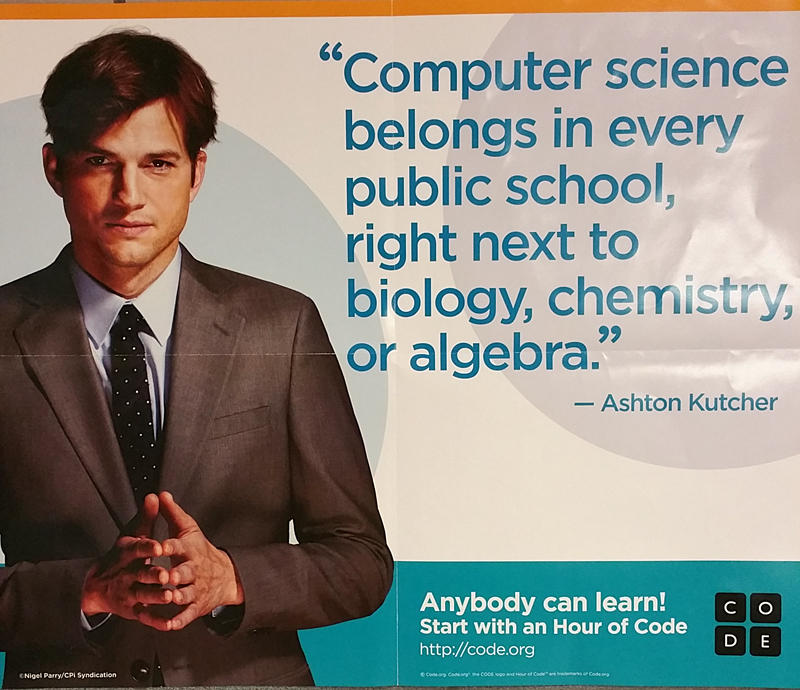 This entry was posted in daily life of a teacher, ed reform and tagged Ashton Kutcher, STEAM, STEM. Bookmark the permalink. 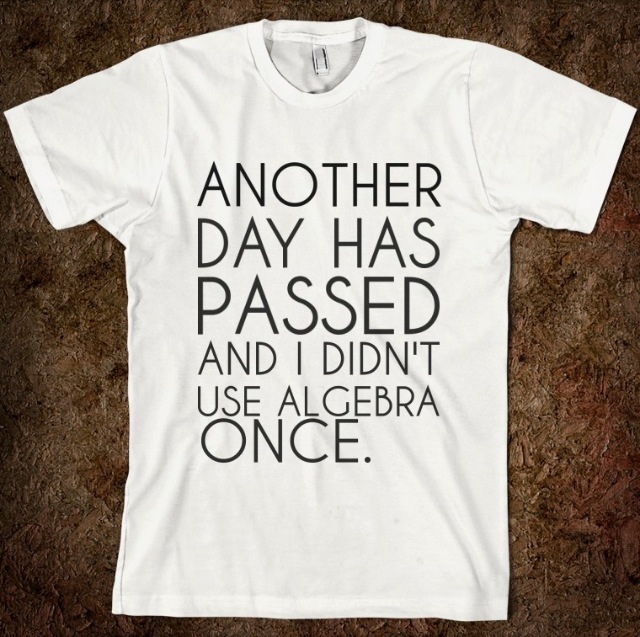 Thanks for checking out my blog on my life as a teacher as well as my thoughts on Educational Reform. I hope that you find what I have to say of value; but more importantly, I hope that you join in the conversation. I don't expect you to agree with everything I say, but hope you are willing to listen. How many others have paid attention, you ask?